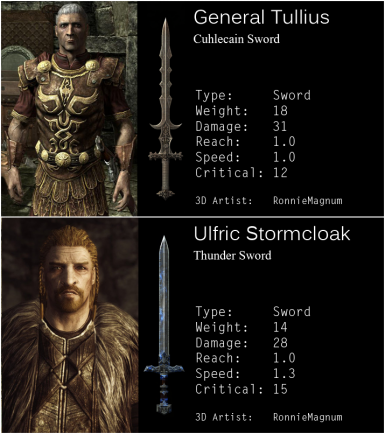 Any kind of permission need to be asked directly to me, since I hold permissions from many other modders. 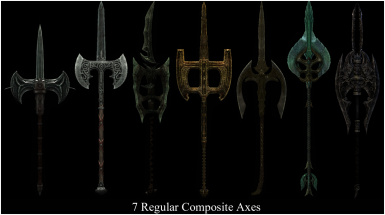 - Adds 102 new weapons to Skyrim totaly immersed/seamless to the world. - Small Tweak: Vendors/Shops with 3x more money. 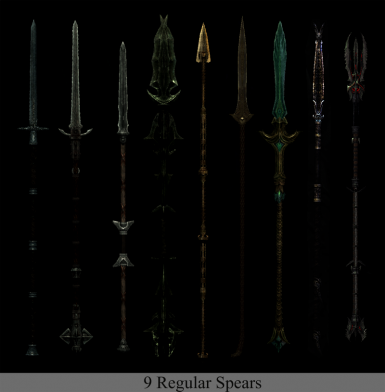 - Small Tweak: Arrows stay attached 30 seconds and max limit of arrows attached raised to 12. 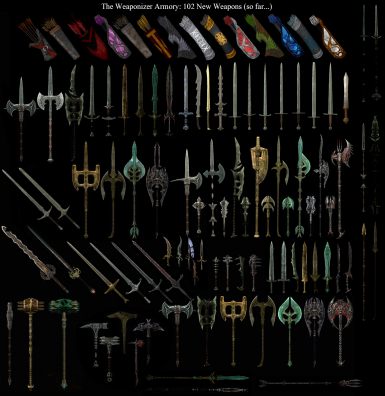 Weaponizer is a project that aims to add hundred of weapons that could/should be in Skyrim, but they were not added, so it is this project goal to slowly completing and adding them while ballance and fix weapons. 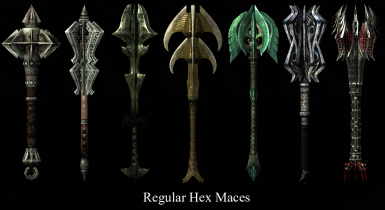 - Fixed the drop rate of Ebony Hex Mace. 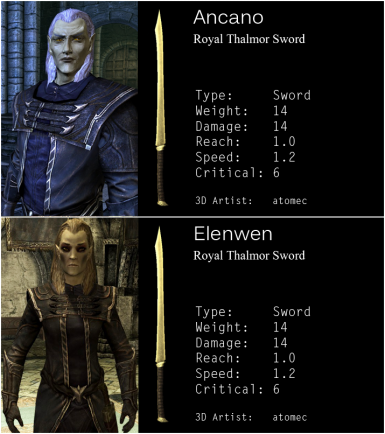 - Fixed the drop rate of Elven Double Axe. Testing this first version you will already realize a seamless integration of those new arrows, please comment what u think. 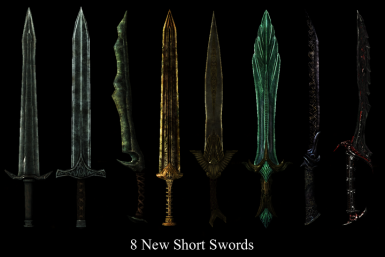 This mod is compatible with any mod that doesnt deals with Level Lists and regular NPCs weapons, if you have other mods that change Level Lists you will need to use Wyre Bah (google it) to make them work togheter... 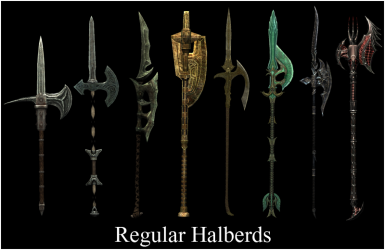 Without, load Weaponizer last. 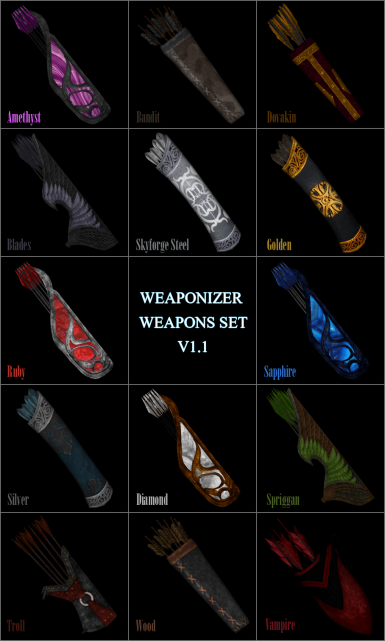 Cause Im not a 3D modeler, I do have my programming, texturing and editing skills, but I dont have much skills on 3d, thats why I setting out weaponizer based on retexturing and/or other amazing artists works. Check next session, CREDITS. 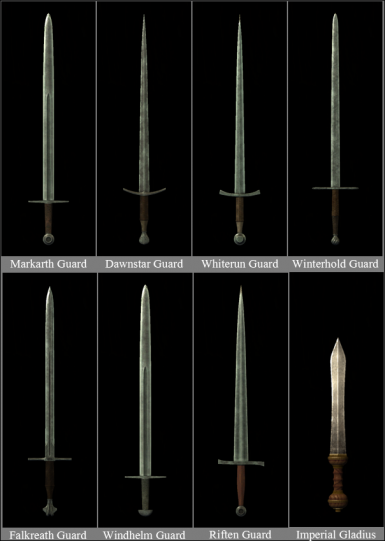 (On Weaponizer: Models used on Guards Swords).